Capture the exuberant essence of Cancun’s nightlife with skip-the-line entry to celebrated club, Dady’O, in Cancun. With your priority-access ticket, you’ll sail past long lines of fellow revelers and enjoy unlimited drinks from an open bar. 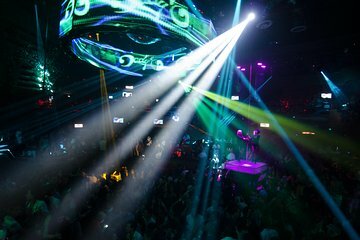 As you soak up the vibrant atmosphere of Dady’O nightclub, you’ll dance to live DJ sets and marvel at light, sound and laser effects that create an unforgettable spectacle. Unlimited drinks and entrance fees are included.